Due to it’s medium body and flavor, this vitola would pair well with a broad spectrum of beverages. I enjoyed it with dry rose’ in the middle of the afternoon, but can see it working equally well, with a vintage port after a substantial meal of meats and roasted vegetables, or following desert with a strong cup of espresso. The Reyes is the only Trinidad in my collection and I’ve been really impressed thus far with the quality and taste of this vitola. There are alot of things to love about this cigar including it’s whimsical pigtail cap, and its elegant cabinet presentation of 24 cigars- 4 rows of 6 cigars stacked between sheets that look like rice paper. The vitola is small yet muscular and compact–and it has a nice feel in the hand–I am a fan of smaller cigars with a 40 RG, such as the Hoyo De Monterrey Le Hoyo Du Prince— 40 RG really suits cigars of shorter length well–it gives them just the right amount of heft. I pulled this particular vitola out of the box and reveled in the aroma of cedar with a backdrop of toasty bread. The dry draw was just perfect. Upon lighting, the initial taste pretty much dovetailed with my expectations–an easy, medium bodied cigar with a nice combination of complementary aromas and flavors. 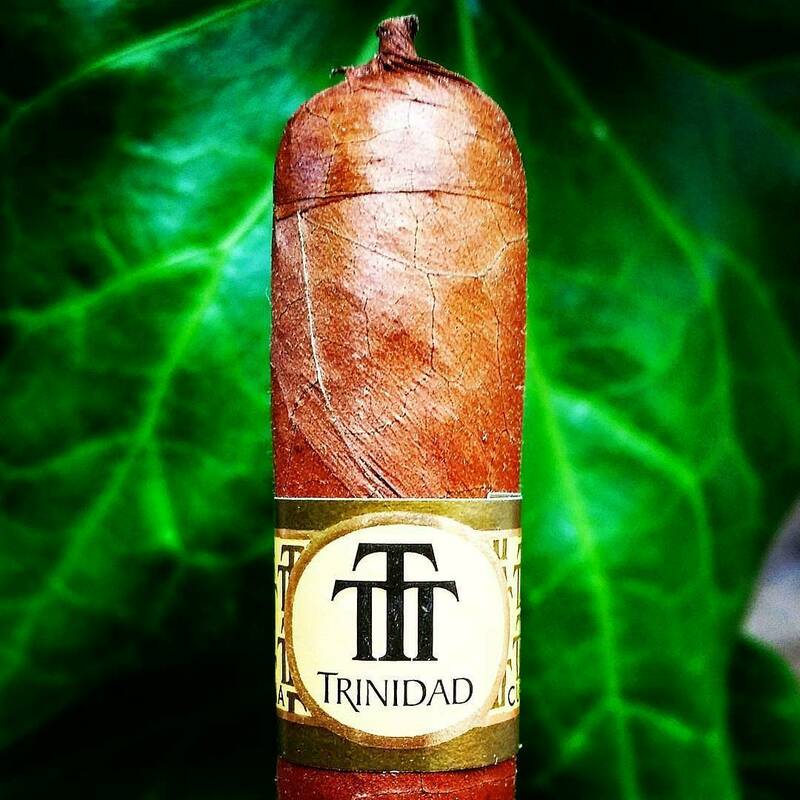 The experience of this cigar can be divided in to 2 distinct phases: phase 1 being a smooth progression of cocoa, cinnamon and light nuttiness–phase 2 offering up peppery notes against a more earthy background, building to a prickly yet pleasant finish. This cigar will continue to age well–my guess is that the cedary notes will continue intensify while the pepper notes may step in to the background.